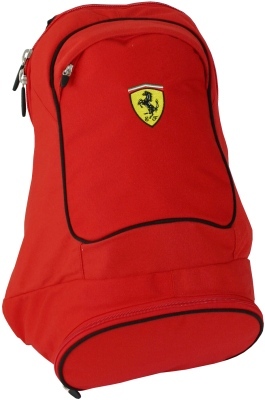 Ferrari Large Performance Ruck Sack - Red. Keep organized with this storm flap covered dual opening Rucksack. Constructed in 1200D polyester Matt Oxford fabric with embroidered shield logo. The upper compartment is padded and lined, ideal for a laptop. The lower compartment is water proof lined and features extra removable padding ideal to protect a camera. Padded mesh ergonomic back comfort and padded shoulder straps with integrated handle and adjustable strapping. Dimensions: 48 x 33 x 19 cm or 19 x 13 x 7 inches.